I remember a time when there was practically one korean restaurant in Perth and when looking for a korean grocery store was like trying to find a needle in a haystack. If I had a hankering for great kimchi, bad luck, there's no chance in hell of finding it. Luckily, there's been a gradual increase of korean population. With it comes the restaurants, the shops and of course the kimchi. My favourite kimchi brand is called Perth Kimchi sold in almost all korean shops, but their main shop is at Myaree. I'd say I've tried quite a few of korean restaurants. Just with any restaurant, it's a bit of a hit and miss. I find that quite a few of them pretending to be authentic, but it's not really. It's like, ok, perth people, let's put loads of gochujang in our dishes, make it really spicy, and call it korean food. Not impressed. 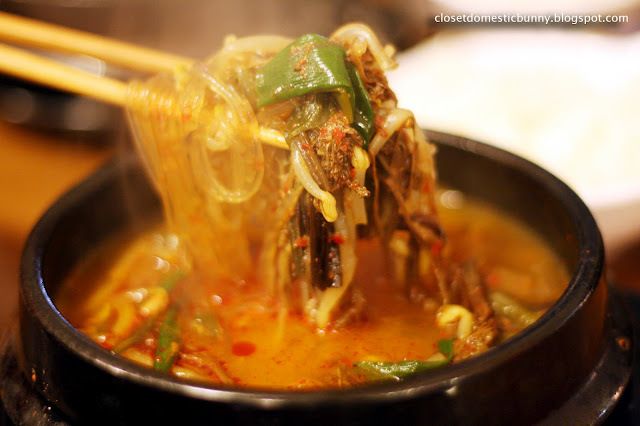 So continues my search for authentic korean food. That night we got together with Maru and hubby at Phill Bean, a korean restaurant that's been seeing a surge of great reviews in urbanspoon. I can't say I was impressed by the service. They were quite busy that night, but we came early so we got seated straight away. The service was still friendly, but not very organised. The staff was very hard to find. We ordered four dishes, three of them arrived first. The fourth dish arrived a whopping 15 minutes after. So the three of us were busily eating, because we didn't want our food to get cold, while one was forlornly watching us eat. 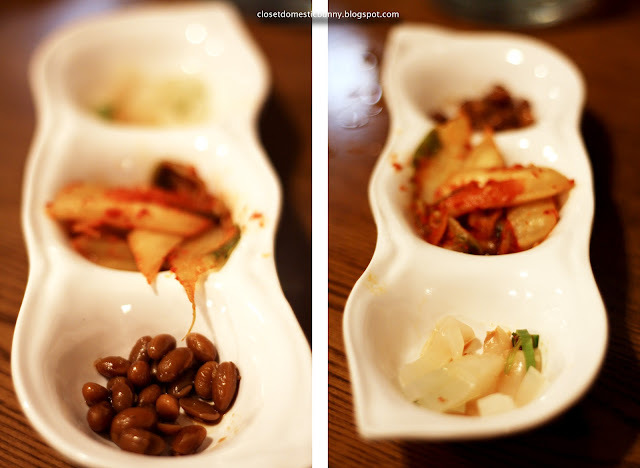 I have to say that the banchan did come out quite quickly after we ordered our mains. The kimchi was pretty good. 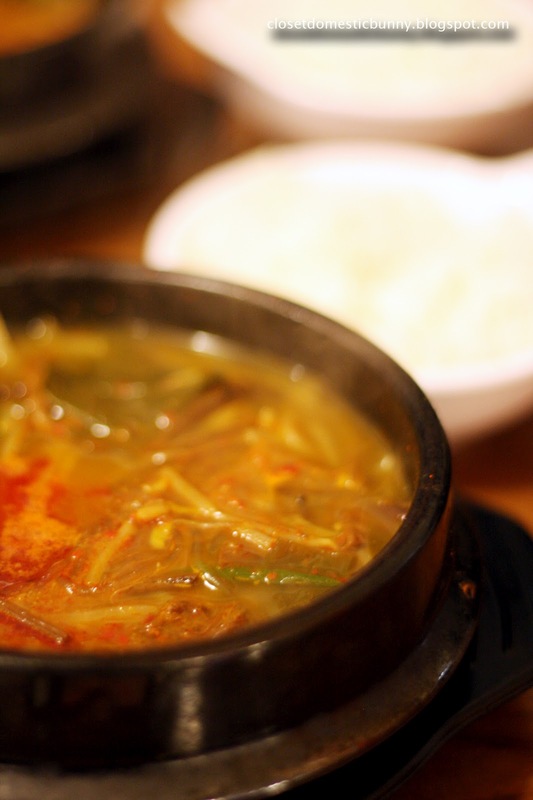 What I like to order most in a korean restaurant is yukgaejang, it's because I can never find a korean store that sells gosari, a key ingredient of yukgaejang, so I can't really cook this dish myself. The good thing about phill bean's yukgaejang is that it did have the gosari, there's variety of ingredients in it and the broth was quite meaty. My beef with the dish is the beef itself. Authentic yukgaejang is meant to use strictly shredded beef, not so with phill bean's. They had beef chunks in there. It did detract from what was supposed to be a great dish. Maru and hubby seems to be quite happy with their kimchi jjigaes. Plenty of ingredients, pork is not tough, broth is substantial. 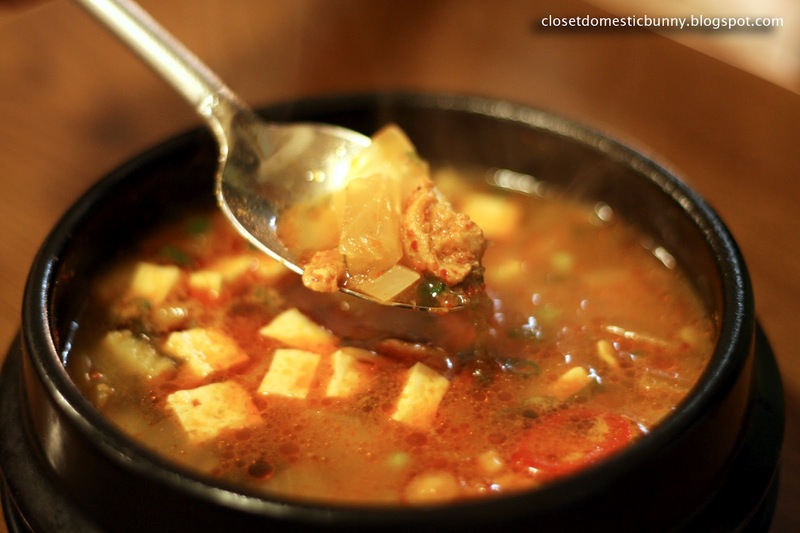 My hubby, on the other hand, was not happy with his dish, the doenjang jjigae. I was skeptical when he said that his beef tasted OFF somehow, because my beef tasted fine to me. I tried it and indeed it tasted a bit funny. And the broth wasn't as tasty as my yukgaejang. 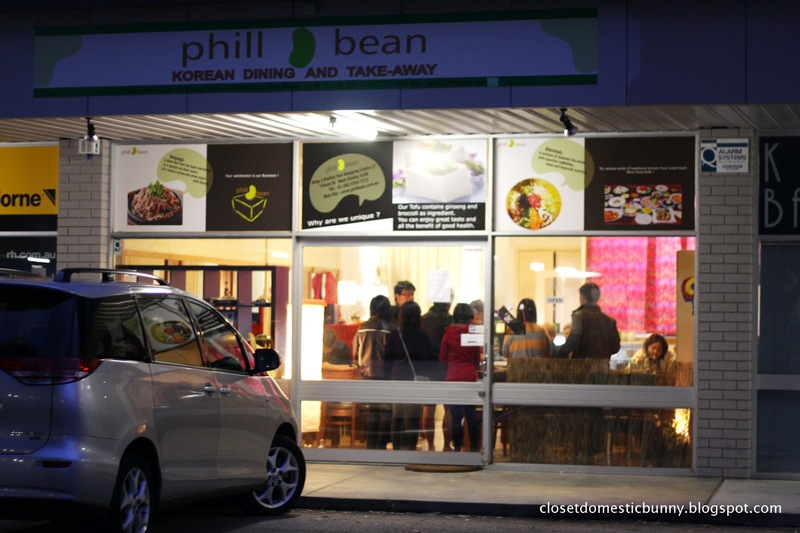 For the price of the dishes, I expected a lot more from phill bean. Being harsh on a family owned restaurant is really hard to do, but at the same time I have to be honest. Its service can certainly be much improved. Its food, with more time, love and a good dose of authenticity, could've been great. I think they should spend more time in the kitchen and less time approaching people for urbanspoon reviews. Just stumbled upon your food blog and I must say I really enjoyed reading it. Learned so much and your pics of food are amazing. As a good friend of the owners of Phill Bean, I alerted them on your feedback, both the good and not so good. Yvonne the Chef was very apologetic and felt bad that the Doenjang Jigae was not to your satisfaction. She explained that this is traditionally a vegetarian dish and would not taste as robust as a meat stew such as Yukgaejung. She was puzzled that the meat is "off" as she is a perfectionist cook. 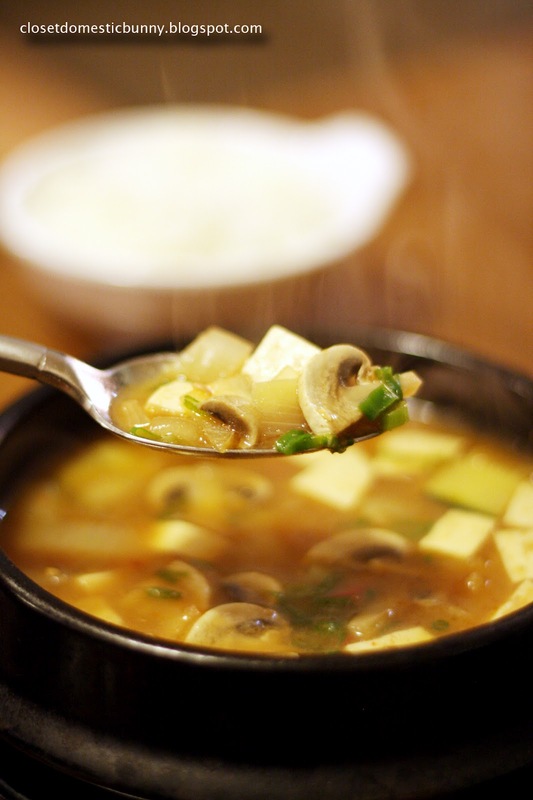 Anyhow, point taken gratefully and she wonders if she could invite you back again for a complimentary Doenjang Jigae. Her actual words, "Please thank her for her valuable feedback and we apologise sincerely for the service and late 4th dish. Could you please invite her to come back and give us another chance? We will work hard and try our best to make sure she and her family has an enjoyable experience." Both Marbean and Yvonne are new to the restaurant business but they take customer satisfaction very seriously. I know that because their customers write good reviews not because they are asked to, but because they are happy to do so. Hi oldyonfoldy, thank you for that feedback from the owner, please convey my gratitude to the chef for her graciousness. I may take her up on the complimentary dish sometime in the future.